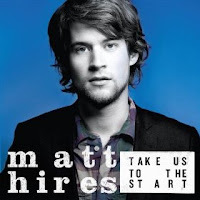 THISisMODERN.net: CD REVIEW: Matt Hires "Take Us To The Start"
CD REVIEW: Matt Hires "Take Us To The Start"
Sometimes a singer/songwriter comes along and takes the music world by storm right out of the gate. Matt Hires is poised to do just that. Like some before him (John Mayer, Jason Mraz), his debut album is so fully awesome that you will be hard pressed to find a track that you don't enjoy. The lead off track and first single is "Honey, Let Me Sing You A Song," which Hires gave us a little taste of in the form of an acoustic demo on his "Live From The Hotel Cafe" EP. This is the song that will make him a household name, and should be all over the radio and at the top of the charts in no time at all. Each song is well written and sung beautifully by Matt, who has a voice that truly unique, not a carbon copy of every other singer on the radio. Songs like "State Lines," "You In The End," and "A Perfect Day" are sure to be future singles on the radio, as this album and Matt Hires becomes one of today's best new talents. Hires has put together one of the best debut albums by any singer/songwriter and will be rewarded by well deserved recognition and success.